If you haven’t had your fill of gingerbread yet, here’s an easy breakfast or sweet treat that should do the trick with very little effort. 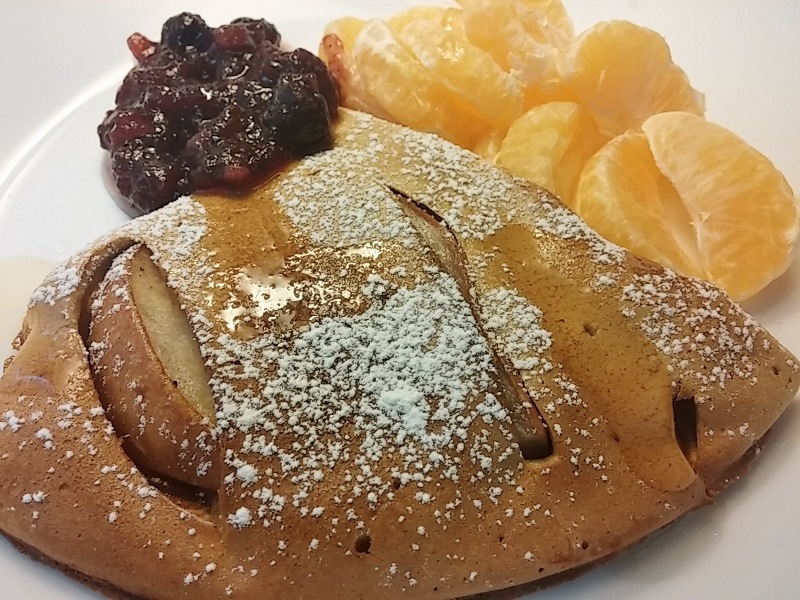 This oven pancake is similar to the old-fashioned Dutch Baby, made famous by Oregon’s own James Beard, a legendary cook who recognized and promoted the 20th century American food movement. Both Jim and Julia Child were big believers in educating home cooks in the value and use of fresh local foods and neither would shy away from generous amounts of cream or butter. By today’s standards, many of Beard’s dishes may seem heavy-handed, but he innately knew how and what makes food really shine. In many ways the Dutch Baby is a crepe on steroids. In this case we use the blender to quickly blend the basic egg, flour, and milk concoction along with a mild blend of traditional flavorings: molasses, a bit of brown sugar, and a hint of warm spices. In a waiting hot skillet, we begin by quickly softening pears or apples in a bit of the pan’s butter. The batter is poured over the fruit into the hot skillet—to give it a quick start—and then it’s popped into the oven to continue baking and rising. Much like a soufflé, once removed from the oven it also deflates fairly quickly, as well. But that will not affect the flavor or the end result of this delicious baby. 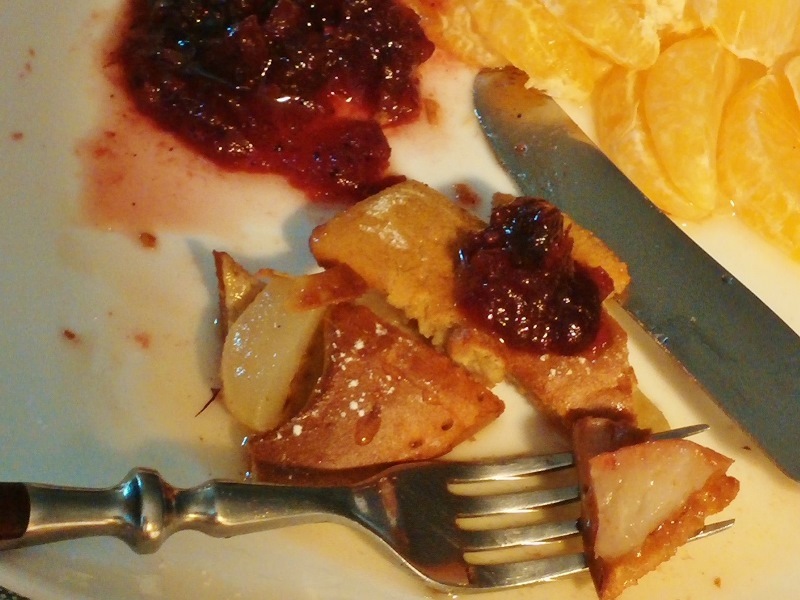 It is even good with cranberry chutney and a slight drizzle of agave nectar. In a blender, beat the egg until pale and light. Add all ingredients through milk, but not butter, and blend well. In a 9” skillet over medium heat, warm 1-2 tsp butter and swirl up sides to coat the pan; add the sliced pears to the hot skillet, cooking just to release juices, 1-2 minutes. Arrange the pears spoke-style in the pan with narrowest ends toward the center. Increase heat to medium-high, add remaining butter around edges and pour the batter into the hot skillet. Bake in hot oven 15-20 minutes. Serves 2. Slide onto a platter and dust with confectioner’s sugar. Serve with syrup or heavy cream.